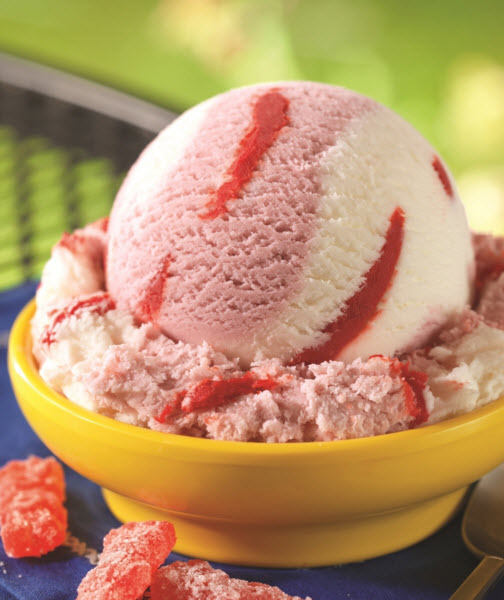 Baskin-Robbins has launched Sour Patch Kids Redberry Blast ice cream. The new ice cream flavor is the brand's April Flavor of the Month. The sour and sweet ice cream is available in a cup, cone or as a two-scoop sundae. The new ice cream is pink, red and white colored. It has 180 calories and 22 carbs for a small (2.5 oz) serving. Dunkin' Brands Executive Chef Jeff Miller says, "The new flavor was developed with the popular 'Sour Then Sweet' attributes that Sour Patch Kids fans love, with a Redberry Sour Patch Kids ribbon swirled in sweet and creamy red raspberry and marshmallow-flavored ice creams." If you like Sour Patch Kids dessert treats you might also try the Popsicle Sour Patch Kids. They come in lime, raspberry and orange flavors. You can find out more about them here on popsicle.com.